In Ultimate Douchebag Workout your main mission is to bulk up as much as possible and become and ultimte douchebag so you can become popular and score with the girls. It’s basically a workout and dating simulator. Become an ultimate douchebag by visiting gym regulary, using all kinds of products. Browse through a big collection of most horrible looking clothes, get a bad haircut, add some tan and watch your character become a real douche. Find out what kind of guys girls are really into. Key 1 restores your health and energy, makes your fat = 0 and cardio = 100. Key 2 adds 50 points to all workouts (don’t press it too much you’ll have to wait for a while) and key 3 adds a level. Sorry if we missed something. 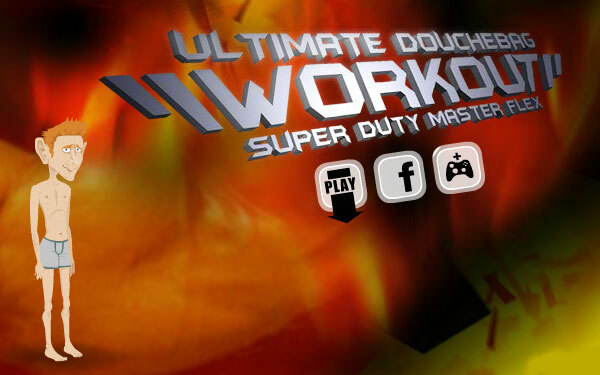 Help your douchebag to become a body buiding machine in Ultimate Douchebag Workout 2. Select which area of your body you want to work on and complete the reps to tone your body.